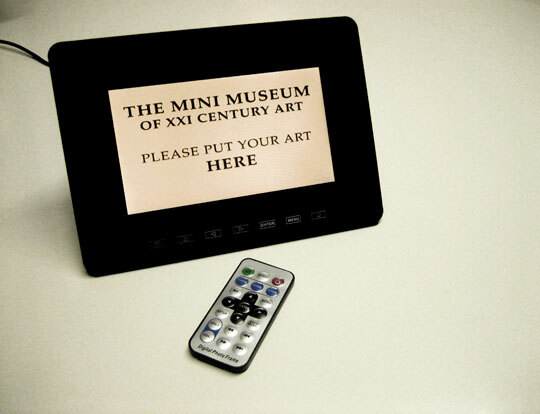 In October 2010 Italian art critic, curator and author Domenico Quaranta launched “The MINI Museum of XXI Century Arts” a pocket-sized nomadic exhibition space comprised of a digital frame bought on e-bay and a USB pen drive. Basically, it’s a really neat museum dedicated to media art that gets passed around the world from artist to artist until its memory is full, then it is returned to its director – Domenico Quaranta. Exhibiting artists gain temporary possession of the museum (key and frame), upload their works and organize an exhibition choosing both the format and venue, and once they are done, they pass the key on to another artist, and so on and so forth. Currently, the key is in the hands of Paul B. Davis an artist and lecturer in Fine Art at Goldsmiths College, London. The MINI Museum has a very informative website , which provides an excellent presentation of the museum and how it works, and full information on participating artists. The MINI Museum is a curious invention. Leaner and less expensive than its brick and mortar counterparts it proposes a less conventional approach to displaying art of the XXIst century and questions the role of the contemporary art museum. Since his first book “Net Art 1994 – 1998” Quaranta has been grappling with the contemporary art world to find an appropriate and sustainable space for the exhibiting and marketing of new media art (a term which is intentionally missing from the nascent museum’s presentations) within the art system. Finally, he found inspiration while reading “dontstopdontstopdontstopdontstop” by Hans Ulrich Obrist under a beach umbrella at the seaside on the Italian Riviera: The Nanomuseum. Marcia Caines. Dear Director, if you don’t mind I would like to bend the discourse towards the future role of the museum as opposed to the future role of digital arts. I recently read some literature on the subject – which is why the MINI Museum caught my attention so – most of which is focused on idea of changing the content, or curatorial strategies, of exhibitions. A popular idea for example is to introduce projects by designers who produce things for ‘social good’ or ‘humanitarian purposes’. There is a new generation of designers who fancy the idea of muscling their way into to the MoMA too! The MINI Museum appeals to me because I like the idea of not having to spend billions on cement, architectural projects and iconic buildings, which are invariably projects of multi-millionaires that in the long run usually make a loss instead of a profit. I like the fact that this museum exists outside a building, it just seems right. (I know the MINI Museum is an elaborated version of a borrowed idea – Obrist etc. but it is innovative in more ways than one). Domenico Quaranta. My old edition of the Oxford English Dictionary says that a museum is a «building in which objects of artistic, cultural, historical or scientific importance and interest are displayed». The online edition adds “stored”, and Wikipedia generously introduces the term “cared for”. These three sources all talk exclusively about buildings, but in the past there have been examples of museums existing in different forms – the best known being probably Marcel Duchamp’s Boîte-en-valise (1935 – 1941). And if we talk about the future, well… maybe a building is not the best way – or not the only way – to exhibit, store and care for art in a digital form. My computer is full of artworks. Some of them are softwares or animations that I downloaded from the artists’ websites – artworks in their “original” form. Some others are low-res versions of images that later became digital prints, or videos, which were sold as limited editions. Some of these works later disappeared from the Internet; some of them can no longer run properly on current operative systems such as Mac OS X or Windows Vista. These works form a collection, which I have to take care of. They have no economic value, but I’m curious to know what will happen in the future, it may be that these artworks will disappear altogether, in that case the one on my hard disk will become the only remaining copy left in the world. Time applies a weird criterion to the selection of objects. Many Greek masterpieces survived through bad roman copies; Roman frescoes survived thanks to the Vesuvius, and were later destroyed by their museification. My computer is not a museum, but the MINI Museum claims to be one. Or, it’s a means of raising these issues. MC. Is your ultimate goal to sell the museum? i.e. The frame, key etc. to an art collector once the collection is complete? DQ. Well, no. Not for the time being at least. My goal is to set up and manage a collection, just like any other museum out there does. I may never achieve this though because the process of building the collection is so unpredictable; it is also the thing that interests me the most right now. Or, should I say: the process of handing the museum over to an artist and allowing it to travel from artist to artist is not a subsidiary to setting up the collection – it’s a key element in the life of the museum itself. MC. Will the Mini Museum be a museum within a museum? A museum within a gallery? A museum within an international art show? DQ. It can be any and all of these things. Maybe,I’ll donate it to the MoMA when I die. Or, who knows maybe the Mini Museum will become powerful enough as an institution to buy the MoMA and turn it into its modern art department! But, as long as it is roaming it can be used to set up an exhibition anywhere: in a gallery, a museum, an art fair, an airport, and even in a private home. Eventually, when I’ll get it back, I’ll use the frame to show the art in the collection, but I will also lend the collection pieces to curators and museums for temporary exhibitions should they require them. MC. Could you not connect the digital frame directly to the Internet, so instead of having to send the key around the world you could send exhibitions directly through the web with unlimited storage? DQ. Oh, that’s so boring! Everything is connected to the Internet nowadays! Seriously, so many people have asked me: why don’t you use an iPad? Why don’t you put it online? Why don’t you connect it to an rss feed? Of course, an iPad can be an exciting platform for exhibitions. 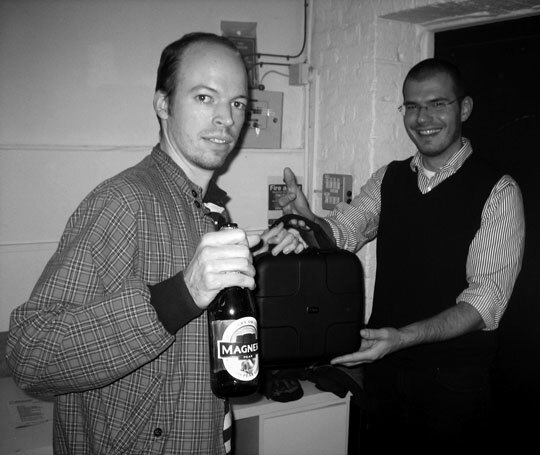 The ftp has already proved to be a wonderful storage device too. And any computer may be a better museum than an offline digital frame equipped with a pen drive: it’s online, it has a bigger storage space and a better screen resolution, and it can handle numerous file formats etc. Today, we can have much more than this with little effort. 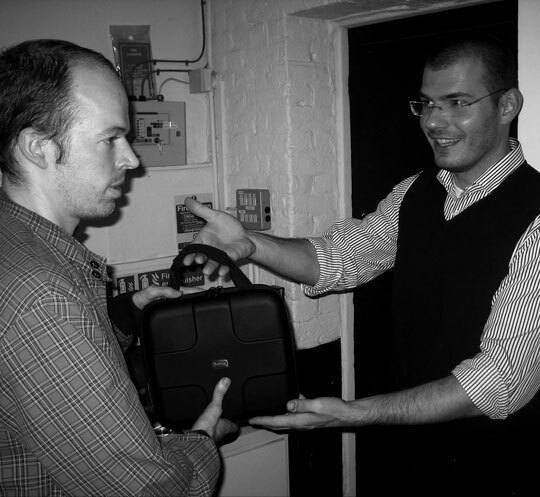 That’s exactly why (1) I chose to work within constraints (a 7” screen, a 4GB storage space, and a limited array of file formats) and (2) to activate an analogue network (to put people in touch, asking them to pass the MINI Museum on by hand). I want to prove that a very limited digital device can be a better museum than some huge brick and mortar institutions. I want to turn something useless into something precious. I want to exploit social networks without forcing people to sit down in front of their computers. I want to show that the power of art doesn’t rely on the power of technologies. And I want to play around a bit with the concept of the original – forcing people to acknowledge something as an original piece of artwork even when it clearly isn’t. Somebody told me: “your museum is so XXth century!” He was right: museums are always at least one century older than the art stored within them. The last Zaha Hadid museum architecture has been conceived with a XIXth century concept of museum in mind. By being so XXth century, the MINI Museum is the ideal place for XXI century arts. MC. How can you make money from it? DQ. I don’t want to make money from it. Really, it’s so nice to make things without expecting much more than fun from them! The MINI Museum is a non-profit institution. Up to now, it hasn’t been that expensive to set up and manage. If, when I get it back, it will become more expensive, I will try to figure out some kind of fundraising campaign or something. MC. How can an average Jane like me visit one of your exhibitions? DQ. How do you visit a show at the Tate Modern? You fly to London, head for Bankside and buy a ticket – if any. Since the MINI Museum is a physical institution, you have to do the same. Check the website, go to the place where the exhibitions takes place or, if you can’t, wait until the MINI Museum comes to your hometown. MC. Are you the rightful owner of the works of art contained in your museum? DQ. Let me ask my lawyer. Actually, I deliberately chose not to ask the artists any form of legal declaration. It just didn’t seem right to me considering the whole process is so transparent. An artist produces a piece, puts it on the key, and sets up a public exhibition declaring that she/he is exhibiting at the MINI Museum of XXI Century Art. If you accept this as a regular donation of an original art piece, that’s it; if you don’t, then you have to admit that your idea of art relies on a Certificate of Authenticity.